The PY 2016 Columbiana County Community Housing Impact and Preservation (CHIP) program will begin accepting applications on November 1, 2016. Funding is available to assist Columbiana County homeowners in need of home repairs and housing rehabilitation. The CHIP program is funded through the Ohio Development Services Agency. The grant is a partnership between the Columbiana County Board of Commissioners, City of Columbiana, City of East Liverpool, and the City of Salem. Funding has been budgeted to each of these communities to provide assistance under the CHIP program. 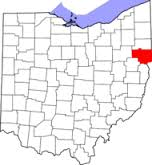 To be eligible, the home must be located in Columbiana County and used as the primary residence of the homeowner, have a household with a total gross anticipated annual income of less than 80% of the Area Median Income. (Example: a family of three must have an income at or below $39,900), current on property tax, and meet secondary eligibility items associated with the home itself. This may include items such as maximum value and ability to address the required repairs with maximum funding allocations. Complete applications are reviewed on a first come, first serve basis taking into account the health and safety repairs needed. In addition to the repair assistance, the program will also provide homeownership assistance that includes down payment/closing cost assistance, and housing rehabilitation. To apply, please contact the following organization listed according to the area your home is located. If the home is located within the City limits of East Liverpool or Salem, please contact Hall Community Development LLC, 635 Bachtel St. SE, North Canton, Ohio 44720 or call 330-499-8266. For all other areas of Columbiana County, including the City of Columbiana, please contact the Community Action Agency of Columbiana County, Inc., 7860 Lincole Place (lower level), Lisbon, Ohio 44432 or call 330-424-4013.